In this project we study convection in the atmosphere and in the laboratory. 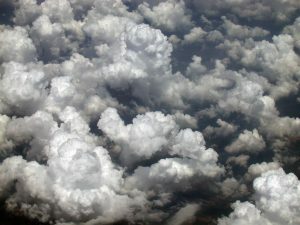 (left) Atmospheric cumulus clouds over the Midwestern United States, viewed from an altitude of 35,000 feet. (right) Convection in a laboratory tank. Atmospheric cumulus clouds develop in response to the sun heating the ground: buoyant air rises, folding in ambient fluid from the surroundings – see clouds movie. 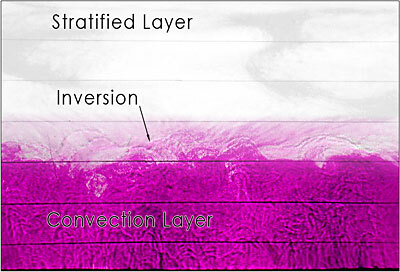 In an analogous manner, heating at the base of the tank triggers convection in the fluid above. Convection carries heat from the heating pad into the body of the fluid, distributing it over the convection layer much like convection carries heat away from the Earth’s surface. This laboratory experiment is a good analogue of atmospheric dry convection and thermal convection in the ocean. It was developed in collaboration with undergraduate Seth Cleven and Prof Rich Clark at Millersville University.